KCC Architectural had the pleasure of being involved in the redevelopment of the National Football Stadium at Windsor Park Belfast. We worked closely with architects Hamiltons, the building contractor O’Hare and McGovern and the stadium director on the successful completion of this prestigious project. 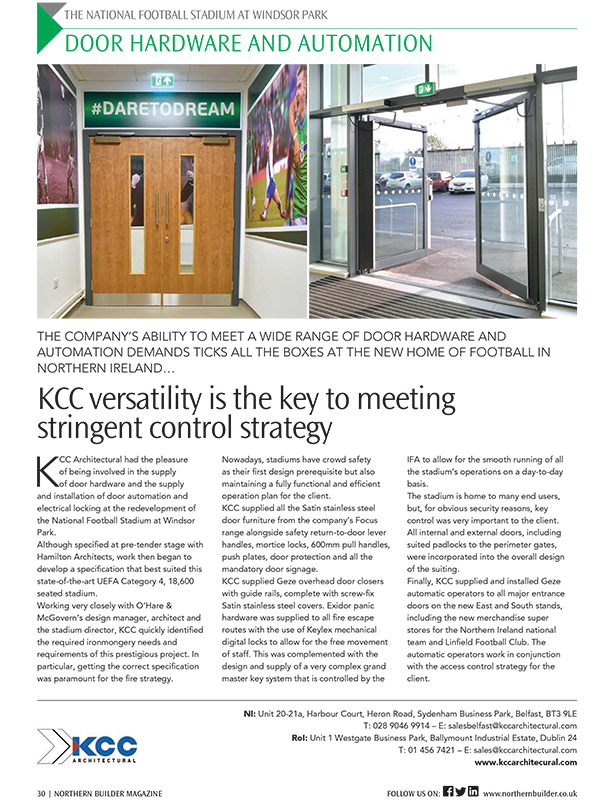 KCC supplied our Focus range of door hardware throughout the stadium. We also supplied and installed GEZE automatic door operators, Exidor panic hardware, Keylex mechanical digital locks and a master key system as well as a complex master key system with highly stringent key control security reasons. The modernisation of the stadium saw the ground being completely overhauled and included a new playing surface; new covered stands; improved drainage; demolition work; modern seating installation, integrated media and lighting facilities not to mention an overhaul of the interior facilities. The redevelopment project, which took 29 months to complete was officially opened in October by FIFA president Gianni Infantino. The all seater 18,600 capacity stadium is a wonderful addition to the sporting culture of the city of Belfast. See below our write up in Northern Builder in relation to our work on the Windsor Park project. If you would like any more information on this particular project or indeed want some expert technical advice on an upcoming project and our range of products don’t hesitate to contact us today at the KCC Architectural office nearest to you.